Honda Innovations is working with Honda operations globally to establish startup liaisons, provide protocols and best practices, and engage with startups and entrepreneurs who share Honda’s vision for transforming mobility. 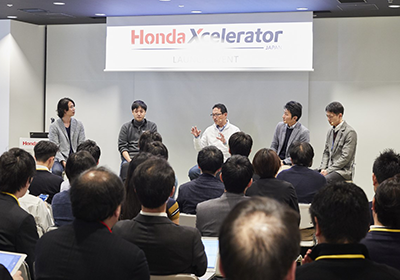 Honda Xcelerator’s global expansion continued with its Japan operations official launch on February 9th, 2018 at Honda Innovation Lab Tokyo. The evening began with a welcome message from Honda R&D, Inc. Operating Officer and head of Honda R&D Center X, Tsutomu Wakitani. 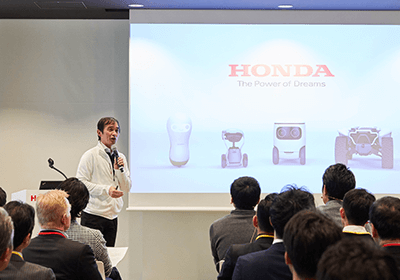 Wakitani gave an exclusive look inside Honda’s 3E robotics concept and issued a call-to-collaboration to startups in Japan and globally that specialize in the robotics space. Honda Xcelerator’s broad areas of focus include: AI/Robotics, Human Machine Interface, Industrial Innovation, Personal/Share Mobility, Energy Innovation, Connected Vehicle, and Vehicle Data Business. These reflect Honda’s extensive expertise in a wide range of products from vehicles and motorcycles to power products, jets, robotics and beyond. 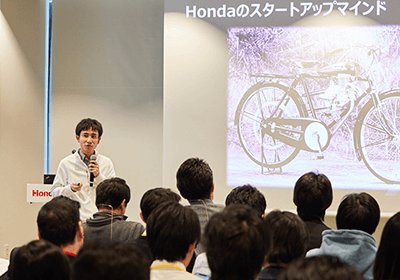 Honda Xcelerator’s local representative, Satoshi Haneda, shared Honda’s origin story as a sort of “startup” when Mr. Honda launched the first product, a bicycle rigged with a surplus gasoline engine from a power generator. With the same challenging spirit today, Honda Xcelerator is focused on continuing to bring dreams to life, leveraging the world’s latest technology startups. Current startup partners, DriveMode and Nextremer joined the event, pitching their technology to an audience of over 100 VCs and startups. Illustrating previous Honda-startup collaborations, a 20-minute panel discussion led by Toshimichi Namba (World Innovation Lab (WiL) partner), featuring Nick Sugimoto (Honda R&D Innovations, Inc. CEO, Yo Koga (Drivemode, Inc. CEO), Hisahiro Mukai (Nextremer CEO), and Kei Nakajima (HM Business Development Business Analyst) rounded out the programming for the evening. With plenty of food for thought and delicious catering awaiting the guests, the evening concluded with a networking reception, and likely, the beginning conversations of a future Honda Xcelerator startup company. By engaging more deeply with the local startup community, Honda Xcelerator startup liaisons will create win-win opportunities for collaborations between top innovators and Honda. Watch a video from the Honda Xcelerator Japan Launch Event here.